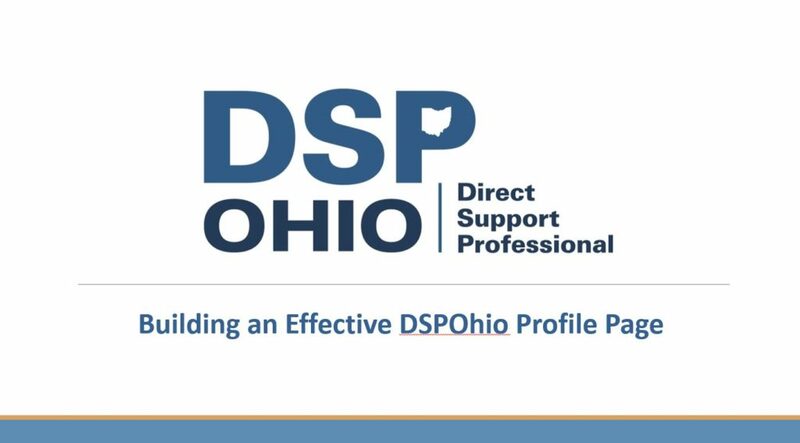 DSPOhio is a statewide DSP recruitment effort that combines a multi-media advertising project to brand the term DSP with an on-line DSPOhio job site that connects potential employees with subscribing DD provider employers. OPRA launched DSPOhio in direct response to the number one challenge facing Ohio’s Developmental Disabilities System–the workforce crisis. Providers are experiencing record high staff vacancies and employee turnover. In addition, the federal Department of Labor projects that direct care will be the number one job in demand during the next twenty years, resulting in a challenge of significant proportions. We have to compete! Little is known about DSP’s outside of the IDD system. We have to aggressively market and brand the term DSP to help people understand the inherent value of the job and then immediately connect those who might be interested to an employer. To effectively recruit DSPs on an ongoing basis a coordinated, centralized process (complimentary to your own agency efforts) is required to increase awareness of and familiarity with the role of DSPs and who they support. For this website, the term DSP is inclusive of all types of direct support positions including waiver, ICF, employment, day array and transportation. Through the use of continual multi-media purchases DSPOhio will continuously build awareness and understanding of the term DSP, the rewarding nature of the work and the potential career opportunities available. Using a data-driven, integrated marketing communications strategy, DSPOhio focuses on provider identified employee demographics and offers interested employees a simple way to immediately connect with prospective employers. The DSPOhio website functions as a job site and will be the conduit between interested employee and provider employer. For instructions on how to subscribe to DSPOhio, please click here. DSPOhio is a subscription-based service open to all DD providers. Revenues from subscriptions and advertising will be reinvested back into multi-media buys–ensuring an ongoing recruitment effort. All components of DSPOhio are data-driven and measurable allowing for continual learning and adaptation to become more and more sophisticated and effective. To view the slides from the April 25, 2018 webinar, please click above.